I’ve just returned from a trip where my husband, baby and I were fortunate enough to take in the sights, sounds and delicious tastes of Athens, Santorini and Paris. After we wandered the streets, savored the tastes, and took it all in, I came to one conclusion – traveling with a baby lets you see the heart of who people really are when they are soft and open and available. From the various airports, taxis, hotels, tourist attractions, busy city streets, even the Parisian restaurant owner who gently spoke to and rocked our baby to sleep while we ate lunch, the universal language of love seems to be spoken best by a baby. Before opinions, beliefs and the idea of being separate began to lace our conversations and color our relationships, we were all nonjudgmental, accepting and offered love first. And I think, even while being smart about relationships and balancing vulnerability with wise decisions, there is still room to be open, and accepting. Witnessing this firsthand from complete strangers was very moving. It takes a very strong and aware person to rise above differences and to honor another person even if their beliefs and opinions are different than our own. Because perhaps maybe, just maybe, that person who really bothers us or makes us mad, or that person we can’t help but judge, perhaps that person is the perfect person to help unlock that same characteristic that’s also within us. Maybe that’s exactly why this person has crossed our path, to help us soften, accept and realize how alike we really are. What we see in others is merely a reflection of what we have within us. Recognizing this gives us an opportunity to unlock any judgments or criticisms we may be carrying around, which means we get to work on real inner growth. Our baby got to spend a couple of weeks being adored by people in other countries and we got the overflow of that love. It happened so easily, so naturally. There were no differences between us. 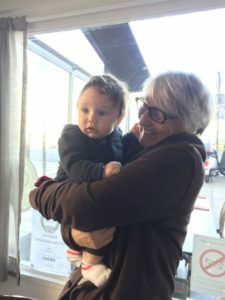 The common denominator was the same – we all really love cute babies. :-). We all deserve recognition, adoration and love, even if we aren’t an 18 pound squishy, adorable little baby; because we are all worthy of it. There is nothing we need to do, achieve or accomplish. As babies all around the world remind us – the fact that we are here makes us worthy. It’s just up to us to accept it and consciously show it to those we share our lives with. Everyday we get to choose how open and available we will be. I’d love to hear what you think about the universal language of love, worth and accepting our differences. Please leave your comment below. PS Like what you read? Share the love!